Firstly, it does indeed come from the coast of California. Youngsters hang out in flat, sandy areas in deeper waters than their parents. They're fully grown when they reach about 1 metre (3.3 ft) long, by which time they will inhabit rocky grounds at shallow depths. A little cave or crevice might serve as a daytime shelter for over a decade! These sharks are real homebodies, sticking to a 1,000 m2 (11,000 sq ft) territory for years. 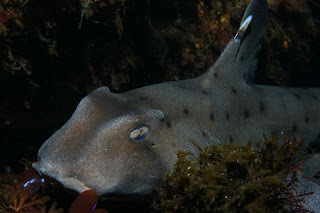 Come the night, the California Horn Shark is finally drawn to activity. Horn Sharks are sluggish, slow swimmers who eat even slower prey like snails, mussels, sea urchins and crabs. There's some really tough shells to get through in there, so the California Horn Shark is armed with a powerful bite and some really strange teeth. The teeth at the front of the mouth are sharp and used to grip onto prey. If something like a mussel is firmly attached to a rock, they will turn their whole body into a lever - push their tail down to push their head up and help pry it off. Their upper jaw can also protrude forward to be used like a chisel. Prey is then sucked up and left to the back teeth. These are smooth and rounded and act a lot like our own molars, cracking and crunching through shells to reach the meat within. Turns out they have one of, perhaps THE most powerful bites relative to size of any shark in the world! They will return to their hiding place when the Sun comes up. Oddly, they actually NEED that to happen otherwise they don't actually realise that it's time for rest. One experiment saw them active for 11 days because they didn't turn the lights on! Imagine how much you could get done if your brain didn't insist on making you tired after 16 hours! Lesson learned. It's so inspiring to see the shock of understanding flash across their face. Of course, sometimes there are other animals who would quite like to make a meal of a California Horn Shark. Not least our very own Angel Shark hiding in the sandy floors frequented by the youngsters. They have a rather brutal defence; both of their two dorsal fins are armed with a great, big spike. Ouch! That'll teach 'em! 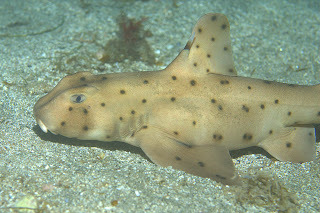 Female California Horn Sharks lay up to 24 eggs and will wedge them into rocky crevices. It will take some 6 to 10 months for the young to emerge and they will mainly eat worms, sea anemones and small clams. The ridiculous power of those shell crushing teeth will have to wait. Any chance that dorsal spike is venomous? @Crunchy: They're not venomous as far as I know. I guess the killing has to stop somewhere! @Chloë Langley: Yes! And that's a youngster, too! I have to agree, they seem to have an intelligent look in their eyes. They might even have the philosopher's eyebrows!